Yesterday I was in Walgreen's shopping for a new lip balm. I had become tired of my usual Carmex, it had become uber drying and in general an all around bad look. I decided to go with Eos and I must say im glad I did. My lips are kissable (not that I have anyone to kiss...but thats another story...lol) and moisturized for a lengthy period of time. I also really dig the shape of the balm its fun and easy to find in my purse. 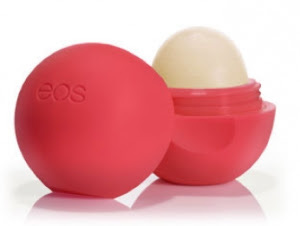 Another plus is that Eos lip balms are 100% natural. If you ever find yourself in the market for a new lip balm I recommend Eos.